Run or Walk, please join us for this fun event to support the Friendship APL in Elyria, OH! Shirts will be available for pick-up on race day. This race is brought to you by the Lake Ridge Academy APL Service Group and Cause for Paws Club. All race proceeds will be donated to the Friendship APL, 8303 Murray Ridge Road, Elyria, OH 44035. On Wednesday, May 8th at 7:00 PM, Friendship APL will be partnering with Attorney Lucy O’Shaughnessy for a community event. Attorney O’Shaughnessy will review the Ohio law, which gives you the right to make your health care decisions. Let’s help ensure that your wishes are honored, regarding life-sustaining treatment, and designating who you want to speak for you, if unable to do so for yourself. There is no charge for the event, which will be held at the Friendship APL located at 8303 Murray Ridge Road in Elyria. FAPL is suggesting a $20 donation per person to attend this event. Space is limited. Please bring a photo ID so that the paperwork can be notarized. Please visit www.oshaughnessylaw.net for more information on Attorney Lucy O’Shaughnessy or if you are in need of any other legal services. 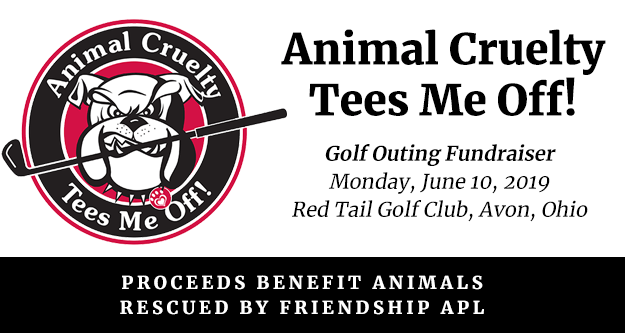 Proceeds from this outing benefit animals seized by Friendship APL Humane Officers and help offset the cost the shelter incurs from spaying/neutering and other medical expenses. Enjoy 18 holes of golf, cart rental, box lunch, dinner, contests, food & fun – all to benefit the Friendship APL. Contact Deb McFadden at (440) 759-7921 or dmcfadden@osbornecapital.com for more information on the golf fundraiser. Support the Friendship APL while having an entertaining evening at this benefit car show on 37711 Detroit Rd. in Avon Aug. 24 from 10am – 3pm. Enjoy awards, door prizes, pet blessings and even adopt a dog! Entry donation $10 per vehicle; Pre-registration $8 per vehicle. Spectators are free, but donations of pet food and litter appreciated. If you would like your event benefiting Friendship APL featured on our website and Google calendar, please submit a flyer for approval to stephanie@friendshipapl.org. We ask a minimum of 30 days before your event so we can approve and update our website. If you would like an event shared on social media that is benefiting FAPL, please share to our Facebook page and we will approve and share from our site. Any questions? Please email stephanie@friendshipapl.org. If you have any questions regarding any of our upcoming events, please feel free to give us a call at (440) 322-4321 x230. We look forward to hearing from you soon!